When visiting Hilton Head there are many rental properties to choose from. Our villa is located in the Palmetto Dunes Resort and we offer affordable rates which allow our guests to save on their vacation while enjoying the beautiful landscape of the Fazio golf course and a scenic lagoon setting. Our St. Andrews property is located directly across the street from the Shelter Cover Marina in the middle of the island, making it very accessible to all activities. There is a large pool that overlooks the golf course a few yards from our villa. We are less than two minutes from the beach and tennis facility making it very easy to walk, bike, or drive to the activities you desire. Our first class, yet affordable, accommodations include a sunken living room with cathedral ceilings, a queen-size sofa bed, large flat screen HD TV with cable and a BluRay player. We offer a full kitchen with breakfast bar and adjoining dining area. Our master bedroom contains a king-size bed, private bath and a flat screen HD TV. A spiral staircase leads to the second bedroom with twin beds a private bath and a flat screen HD TV. There is an in-suite laundry room with a full-size washer and dryer. French doors in the living room open to a quiet, outside deck. And of course the villa has secured internet access. Our villa will provide you with everything that you will need for a fantastic vacation. The world-famous beach is only a few minutes from our villa. Bring or rent some bikes and in two minutes you are riding on the sand. We love the beach! We have been vacationing here since 2002 with our children and, occasionally, our extended family. Each year we make the drive from New Jersey, or 'Jersey' as we call it, for our week or two on the island. This year, 2014, we were able to purchase the villa from Michael's parents and now we own our own slice of paradise! We are very happy to call H.H.I. our second home and grateful for the opportunity to spend more time here! Palmetto Dunes is a secure, gated community. St. Andrews Common is peaceful, beautifully landscaped and well maintained. St. Andrews has a beautiful pool and pool house for your use. Palmetto Dunes offers a free shuttle service that will take you where ever you want to go within Palmetto Dunes and Shelter Cove. Some of the many things Shelter Cove offers are live music, fireworks, craft vendors, shopping, fishing excursions, and dolphin cruises. Both Palmetto Dunes and Shelter Cove are located center island and are easily accessible to many activities, such as beach, golf, tennis, shopping, biking, fishing, boating, and restaurants. St. Andrews is private, quiet and peaceful. Our villa is the perfect retreat for a relaxing get away. It's your home away from home! Centrally located and near many activities, it makes exploring the island easy. Enjoy the free, secure, high speed internet, new flat screen HDTV's, comfortable beds, relaxing deck and all the comforts of home. Perfect for families, golf trips, or romantic getaways. 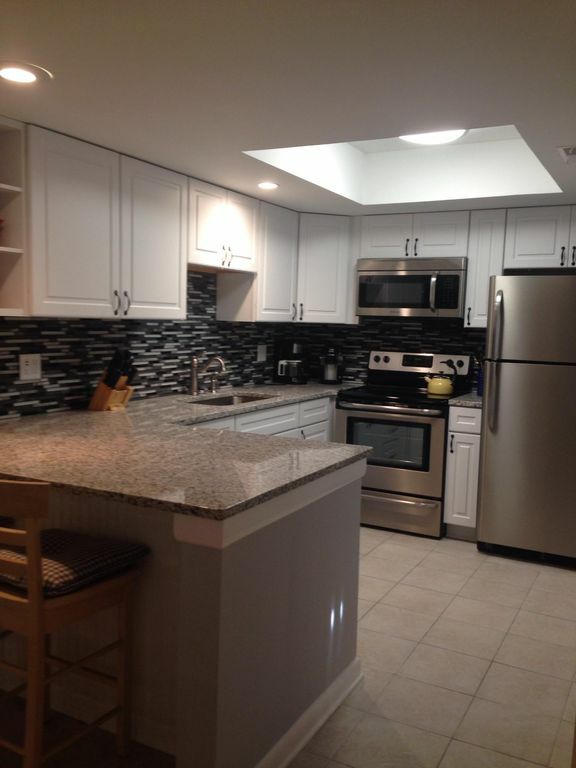 Brand New Kitchen - All new cabinets, granite counter tops and stainless appliances. Completed Dec. 28, 2016. Blu-Ray player with streaming capabilities. Stream your favorite movies via your Netflix or Hulu account. This was our third year coming to Hilton Head and our first stay here. The owners are great and very prompt on any questions. We stayed a week and had no issues the whole time. Look forward to staying here again. A lovely condo in a quiet area of Palmetto Dunes. Located about midpoint on the island, it's easy to get to lots of places. It's a 15-20 minute walk to the beach (North gate access) on a bike trail that is on a beautiful tree-lined boulevard. One morning as I crossed the bridge closest to St. Andrews Common (the private community the condo is in) I spotted an 8 foot alligator swimming in the lagoon. There were lots of birds (great blue herons, white egrets, etc) on the shore. The sounds of the osprey come and go all day long. The owner was wonderful to work with-very responsive, very helpful,and very quick in responding. She also helped resolve a little issue that needed attention during our check-in. Our daughter and son-in-law, their 2 small children and his parents, brother, sister and brother-in-law stayed in a house about 2 miles from this condo where my wife and I stayed, making it very convenient to get together and see one another and play at the beach. We had a very good week! Thanks, Tom, for such a great review! We are so happy that you both had a great vacation! Our location is the best on the island! Being located center island makes it so easy to get to where you want to go--beach, shopping, restaurants, etc. We are always happy to make recommendations so our guests can have an awesome experience! We would love to welcome you back in the future. Had a wonderful vacation in Hilton Head! Loved the villa, especially the kitchen! The Kellys’ attentiveness and attention to detail were outstanding. Leading up to and throughout our trip, Maryellen was so helpful with restaurants, points of interest, attractions, etc. Would definitely stay there again! Thanks, Christy, for your awesome 5-star review! We are so glad that you and your family had a wonderful vacation! We love HHI and the surrounding area and are always more that happy to make recommendations to our guests on how to enjoy it all! We would love to welcome you back in the future! Thanks, Mike, for your wonderful 5-star review! We are very happy that you and your family had a great vacation! We strive for that "home away from home" feel at our villa. We would love to welcome you back for future stays! Excellent accommodations. Close to everything! We had a great vacation! Thanks, Matt, for your wonderful 5-star review! It was a great week...the sun was out, the food was great and your neighbors were perfect!!! Summer weekly reservations are Saturday to Saturday. Check In Time ; 4 PM Check Out Time; 10 AM Cancellation Policy: 100% refund if cancelled at least 30 days before arrival date. There is a $15.00 fee assessed for each vehicle parking permit per week. This fee is paid directly to the security office when you pick up your parking permit. Please be advised that motorcycles, motor homes, campers or boats are not permitted within Palmetto Dunes Resort.